the way of the dress: Day 2: What's In A Name? Doing the inventory again in the RabbitHole closet. I had to take a picture of each garment. Out of amazement, I ended up taking close-up shots of the tags as well. Just a few of the brands in the RabbitHole closet... trust me, there's more! 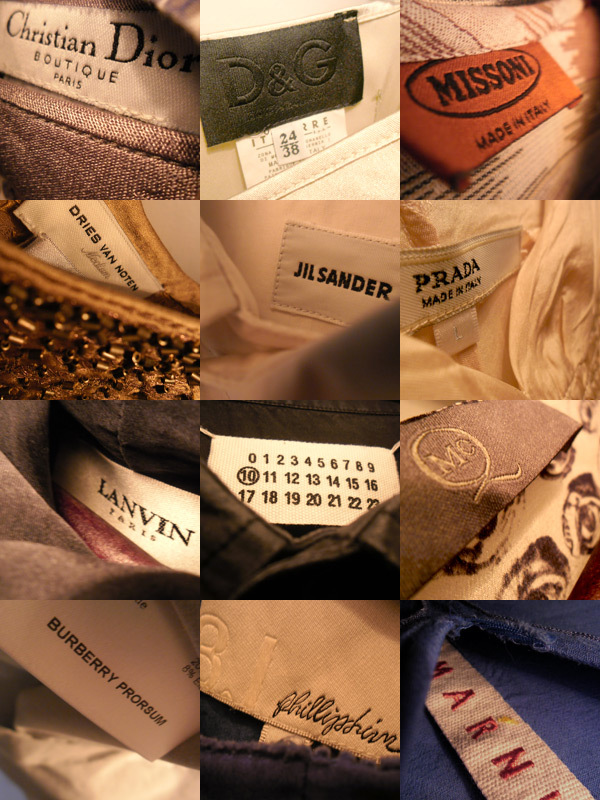 Dolce & Gabbana, Prada, Lanvin, high-end labels, fast fashion brands, it's all in the closet. A few of our clients often wonder why the styling rates are quite high as compared to other stylists. It's hard to give a straight answer. But here's my two cents. In the same way that these labels give an assurance of quality, craftsmanship, artistic integrity and of course beauty, RabbitHole gives that same assurance to the clients. Each photo shoot is meticulously conceptualized, directed and stylized to be as breathtaking as can be. In the end, you get more than what you pay for. How about that? I actually learned something while rummaging through piles of Prada.